This buttermilk and red curry marinated chicken fillet is inspired by an American favourite Southern Fried Chicken. The KNORR Thai Red Curry Paste adds a nice spice and flavour which matches perfectly with HELLMANN'S Mayonnaise. Combine the chicken, buttermilk, KNORR Thai Red Curry Paste. Marinate for a minimum 3 hours. Mix flour, smoked paprika, garlic, onion and coriander powder and divide into two. Strain the buttermilk marinade off the chicken and mix with one of the divided flour mixes to form a light batter. Dip in the marinated chicken into the other divided flour mix then into the batter mix. Shake off excess batter and fry in hot oil 160C for 10 minutes. Transfer to a plate, lined with paper towel. Combine HELLMANN'S Mayonnaise and KNORR Thai Red Curry Paste. 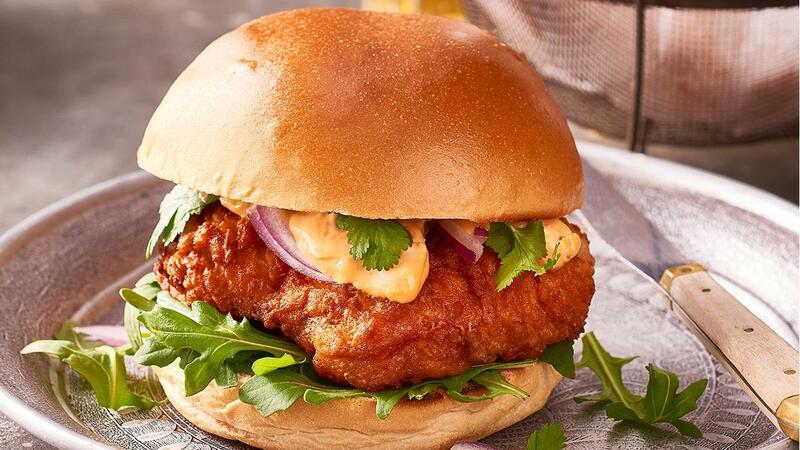 Grill the buns; place rocket on top of bottom bun, then fried chicken, red curry mayonnaise, coriander and red onion, top with lid. Serve with wedges. Flatten chicken with a meat mallet to ensure a quicker cooking time.